August Johann Roesel von Rosenhof provides the main body of text, as well as the illustrations for the volume. Alberti von Haller provides a preface. Johann Roesel was born into the Austrian nobility at Augustenburg, March 30Â 1705. Roesel’s father died shortly after his birth and was accordingly entrusted to his godmother princess Augusta Dorothea von Arnstadt-Schwarzburg. Dorothea saw that young Johann became an apprentice under his uncle Wilhelm RÃ¶sel von Rosenhof, a noted painter of animals. Under Wilhelm’s tutelage Johann excelled as an artist, eventually maturing his education at the Academy of NÃ¼rnberg under the supervision of Johan Daniel Preisler. He so excelled at his study that he attracted the eye of foreign courts and in 1726 he was invited to Denmark to function as a court painter. It was on a return trip from Copenhagen that he was afflicted with a serious illness and was bedridden for several months. 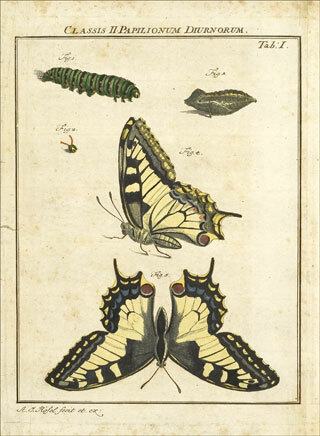 During this time he was gifted Anna Maria Sibylla Merian’s Metamorphosis insectorum Surinamensium, a illustrative study of the insect life of the South American country of Suriname. 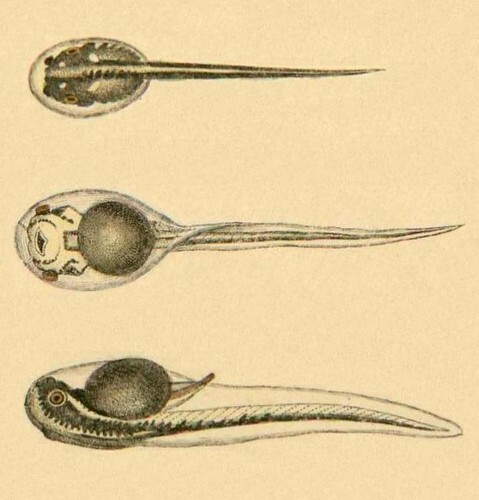 The illustrations of strange creatures and anecdotes of faraway places intrigued Roesel to such a degree that he then endeavored to spend his free time pursuing a new passion for natural science. Roesel set out to chronicle the various insects, amphibians and reptiles of Germany, disciplines which had up until that point been sorely neglected. In 1740 Roesel released Insecten-Belustigung “Insect amusements” and established himself as a seminal academic in the field of German entomology by being the first writer to define insects into natural groups. 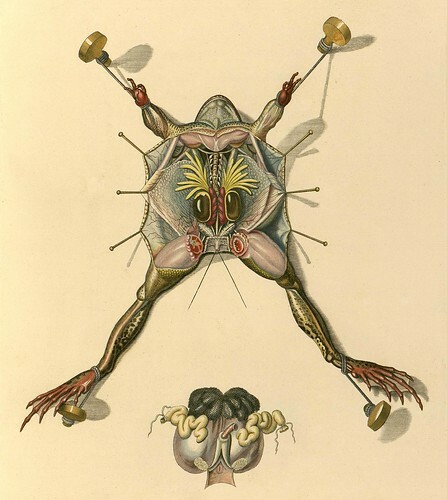 The following decades were dedicated to studying a different sort of organism: frogs. That study culminated in the release of the first installment of the title of our interest in 1753. 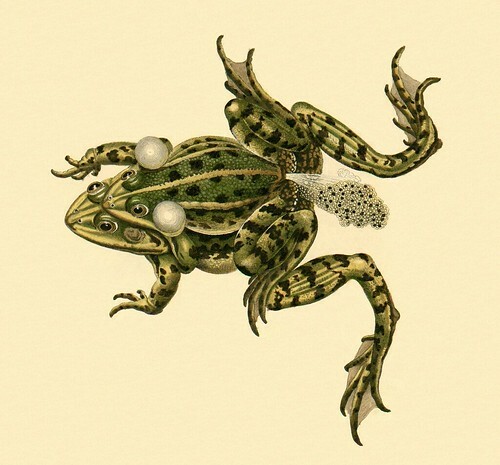 The book covers the entire life cycle of frogs, as well as the habitat and variations in species. While Insecten-Belustigung was Roesel’s first foray into science writing, Historia naturalis Ranarum nostratium secured his place in history as a seminal natural history scientist. Rosel perished before he could release his third great work on the nature of salamanders and other lizards but lived on in the works of Linnaeus, who utilized the former’s notes to inform the basis of much of his work. Johann Roesel was born into the height of the “Enlightenment” era, in which European understanding of the world was rapidly expanding by global exploration, the wealth acquired by colonization and the advancement of science. Reason was accordingly hailed as the prevalent source of social, political and religious authority, and traditional models of government were challenged and collapsed, resulting in the establishment of enlightened (secular) monarchies and constitutional republics. 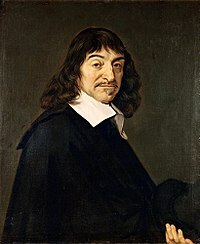 Modern academics and philosophy derives from his period, forming in the wake of a new interest in education and the formulation of a great many new universities and colleges. While education was once a privilege of the select few, it was now considered a necessary social good, at least for the elites of society. Following the European colonization of the Americas and parts of Asia, the modern study of natural science was born, inspired by the strange sights of new lands. Roesel was born into an enlightened royal society which valued the arts and sciences. While in centuries past a man the likes of Roesel might have grown rich on feudal contracts and land, in this age he was offered a liberal arts education and was exposed to the sciences by an enlightened monarch, his godmother Augusta Dorothea von Arnstadt-Schwarzburg. Roesel’s works can be interpreted as a visionary yet natural extension of the academic culture of the day. The Historia naturalis Ranarum nostratium is an important piece of academic work in several ways. Most importantly the volume was the first serious work of herpetological natural history. 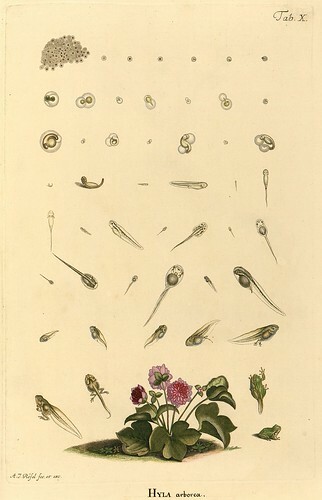 While previous works focused on simply sketching organisms (e.g., Catesby 1731-43. The Natural History of Carolina, Florida, and the Bahama Islands; Seba 1734-1765. Locupletissimi rerum Naturalium Thesauri; or Linnaeus 1759. Systema Naturae), Roesel’s volume involved an extensive treatise on the nature of the creatures, anticipating modern scientific empiricism. In a way the Historia naturalis Ranarum nostratium represents a shift from recreational naturalism to rigorous academic science. The Historia naturalis Ranarum nostratium was printed by Johann Joseph Fleischmann at Council and Chancery Printer, published in installments between 1753 and 1758. Following a flyleaf, there is an initial title page which contains the title of the book in both Latin (Roman type) and German (Gothic). Following the subsequent frontispiece is a more elaborate title page, containing a description of the contents, publication and authorship information, illustrator credits and acknowledgements. Similar to the initial title page, this second and more complete title page is also in Latin and German. Strangely, the name of the preface writer, Alberti (Albrecht) von Haller appears in a more prominent type than that of the author. The Swiss anatomist, physiologist, naturalist and poet was a well known academic figure in his time, and the prominent positioning of his name on the title page may serve a sort of marketing purpose. For purposes of this study, the specimen referred to is part of the University of Strasbourg’s collection. It is a 1758 printing, including all prior installments from 1753 to the date of publication. The first portion is each section is text, concluded officially with a declaration of “FINIS.” Following this portion of the section are illustrations. Each topic of illustration is given a dedicated leaf, including a Table number on the top right corner, the illustrations in the center, flanked by figure numbers signifying particular references in the text. Each illustration is duplicated, first in black and white, followed by vivid color. The paper is cotton rag and has browned through the years. The text is intelligible and illustrations still vibrant, but the leaves show signs of aging; it is unlikely that it will remain in a readable condition after the passing of another three centuries. There is no watermark present. The folio leaves are consecutively numbered following the preface. Alberti’s preface is not numbered; where the page number would be is replaced by a crown emblem. Roesel’s own preface is numbered with Roman numerals. The following text leaves are numbered in English numerals. The table leaves (illustration plates) following the text leaves are paginated with Roman numerals, starting with numeral I. The tables are paginated in a numerically contiguous fashion, separate from the page numbers of the greater text. Although the printer is identified by name and location on the book title page and the interior section title pages, he is not identified with a device. Half of the record is composed in Latin using a transitional Roman type. The other half is composed in German with Gothic type. Historiated initials and serifs are prevalent features of the Gothic portions of the text, mirrored in the Latin portion by bold rubrications. These features precede sentences and paragraphs. Use of italics is present in the Latin portions but absent in the respective German entries. Another interesting feature of the Roman type used in this instance are truncations (-) at the end of words which spill over onto subsequent lines. The volume’s text is printed entirely in black. There are 24 engraved color illustrations, accompanied by 24 duplicate grayscale copies. The frontispiece is also engraved in color. Leather spine and corners with marbled boards. There are seven raised bands and gilt tooling on the spine. The folio leaves are bound to the spine with cotton thread. The condition of the boards is greatly deteriorated, the covers displaying signs of serious degradation. Luckily the text block and spine of the volume are still structurally sound. There are both endleaves and flyleaves following and preceding the text block respectively. Gues 1775. August Johan Roesel von Rosenhof. Dict. Sci. Biogr. 11:502-503. Wood 1931. 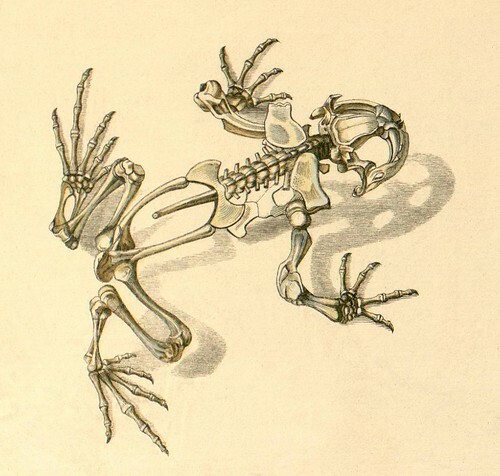 Introduction to the Literature of Vertebrate Zoology, p. 540-545.